Kway chap, originally uploaded by Camemberu. I'm always on the hunt for good kway chap. This is one dish you either love or go "eeew!" at. Porky offal and innards are not everyone's instant favourite. It's a lot of work for the vendor too, cleaning those bits. This stall at Old Airport Road has some of the cleanest-looking small intestines I've seen. I don't usually like small intestines but this is probably the only way I'll eat it. Some people prefer it with the fatty white bits (what *are* those anyway?) clogging the insides of these intestines. Sorry, not for me. Yi Fa Kway Chap at Old Airport Road, originally uploaded by Camemberu. The stall is pretty non-descript and is easily missed. They sell nothing but kway chap and its accompanying side dishes (braised peanuts, preserved vegetables, etc). In general, they do a passable rendition of kway chap. It's one I don't mind coming back to, since it did not give me an upset stomach, unlike the famous To-Ricos at the same hawker centre. i think the "filling" is called vilus or something like that...absorber of nutrients. like you, i love kway chap!!! Nice to hear that u're always on the hunt for good kway chap for i have 2 stalls to recommend =) Apology for being bad at remembering names. 1) Bedok interchange hawker centre. They only do morning from what i've gathered throughout the years. 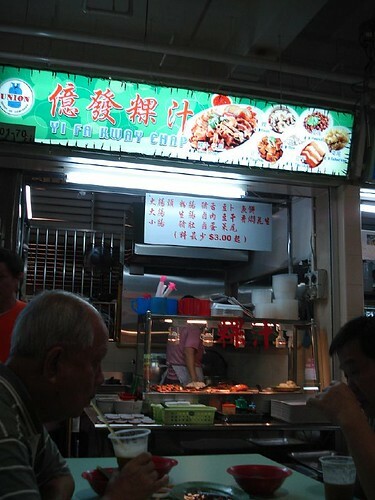 They're right next to a drink stall(at the extreme end of the H.C) Its right behind the "Katong Laksa" stall there. The pig insides are thoroughly cleaned and and kway is really good. 2) Tampines Round Market(next to Tampines Town Council). Its called Lucky kway chap if im not wrong. The kway, to me, is a disappointment but the ingredients are really well-marinated. Remember to whack the kway chap opposite "mah chor keng" in BP this CNY. small intestines are pretty nice in a kiap chye w tomato soup too! eh..something like kiap chye ark (duck). very light and goes extremely well with plain rice. The Bedok Interchange Kuay Chap is the best! I been eating from this stall for 20yrs now, and it's still good. The kuay is the thinnest I have eaten, and the skin is very tender. But have to go there really early, any time after 12.30pm will have not much intestines left. The chilli is also good. However, the soup has a quite a bit of msg coz it will left you thirsty for a while. Anyhow, it's yummy! 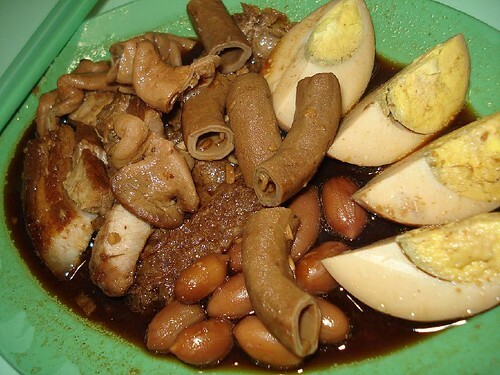 you should also give the kway chap stall located at AMK Chong Boon Hawker Center a try. It's called something like "Hai Xing (MacPherson) Kway Chap" and it is the only stall my parents eat at because all the innards are cleaned properly. If it's not porky enough eating kway chap, do try the ter kar from the bah kut teh stall a few stalls from it - really good too. Amigochen & Apple: yes, I've tried the Bedok one. It's OK, not too bad, but portions are quite small for the price they charge. Southernoise: yeah, I've heard about BKK's fabulous kway chap. Hey, actually best one I've had is in BP indeed. I must blog it in my next visit. Ice: ah, pig stomach would go well in that kind of soup too. I love pig stomach. M: Hmm, AMK. A bit far but that adds to the adventure! I'll second amigochen's recommendation on the kway chap stall at Tampinese Round Market. Tasty and in generous portion too! But like what amingochen had said, the kway isn't really that good. Your Kway Chap photo looks very sinful. I wish I could have some of it now. Too bad not in Singapore. How to get to Old Airport Road by MRT? IceCatSeoul: Hmm, there is no MRT near Old Airport Road (yet - they're building one). I guess you can take bus no.16 from City Hall MRT (Raffles Hotel side facing Raffles City). Dictator: if you read my last sentence, it says I did try To-Ricos. And had a tummy upset after that. *shrug* I know they are FAMOUS but maybe I was there on a bad day. Hello I don't know you but your blog is great! Anyway, I love Kway Chap from this particular Jurong West stall that used to operate in Red Hill. The chilli is divine! hi u have a nice blog. i would recommend the Kway Chap stall along Macpherson Rd. The stall is located under a coffeeshop, next to SWA Garden and opposite the Mazda showroom. they have great duck meat too and serve a mean deep fried intestine.